Ask a local about the best things to do in San Francisco and answers will be punctuated by suggestions for small plates and libations to enjoy along the way: climb Coit Tower then mosey into North Beach for brunch at Mama's; explore the Mission's mural-filled streets and finish with a burrito at La Taqueria; sidewind your way down Lombard Street to a vegetarian lunch at Greens. Food is sport in this city, and climbing all those hills a happy excuse for indulgence. For a visitor longing to live like a local, the path is easy to find. San Francisco is a friendly, low-key place with a happy mix of art and architecture, local culture and sophistication, and food and wine. Seventy-two hours in this city isn't nearly long enough. There's no need to rent a car for a stay in San Francisco. The city itself is compact — about seven square miles — which makes getting around easy. Take cable cars, buses and taxis within the city, and mass transit if you're going to the suburbs. If you're planning to cross the Golden Gate Bridge and explore Marin or wine country, wait until you're you're ready to leave town to pick up your wheels. You will save a considerable amount of time and money. Walking is a great way to experience the real San Francisco, but be prepared to hike up some of the city's legendary hills. Pack comfortable walking shoes and layers: a sweater, jacket, or scarf may all be necessary to battle the city's ever-changing weather and brisk wind. Don't be fooled by California's sunny reputation. As Mark Twain was rumored to have said, "The coldest winter I ever spent was a summer in San Francisco." It really can be chilly here, especially during the months that are predictably warm elsewhere, like summer. 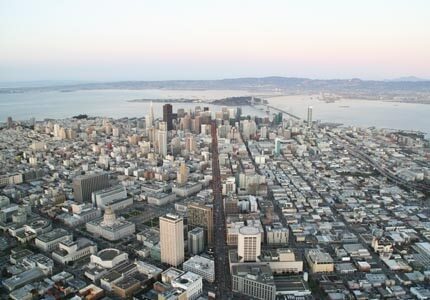 San Francisco has a vast selection of hotels, inns, and bed and breakfasts. Many are in Union Square, an area close to shopping, dining, and the famous cable cars. For straightforward luxury, try the Four Seasons San Francisco on the eastern end of Market Street near the San Francisco Museum of Modern Art, Yerba Buena Gardens and the Ferry Plaza Farmer's Market. Those looking for a hipper digs might like the Clift Hotel. This historic building was remodeled in 2001 by avant-garde designers Philippe Starck and Ian Schraeger; it's home to the famous Redwood Room, and a choice spot for visiting celebs. The modern Hotel Vitale on the Embarcadero offers sweeping views of the Bay, and is just across the street from the Ferry Building Marketplace. And the InterContinental San Francisco is a towering monolith South of Market, close to Moscone Center, with posh amenities and floor-to-ceiling window views. For an ultimate eco-chic San Francisco experience, try the Orchard Garden Hotel, which is as lavish as it is environmentally friendly. San Francisco's iconic Ferry Building, home of the famous Ferry Plaza Farmers Market, is located at the end of Market Street. Far from just a ferry dock for local commuters, the white marble building has become a mecca for local produce and artisanal products—it is a requisite destination, especially for foodies. The building is loaded with a variety of permanent food stalls, specialty restaurants and high-end food boutiques. On Tuesdays, Thursdays and Saturdays, chefs and locals descend on the grand outdoor market to browse the best in fresh produce and artisanal street food. Waterfront benches offer calm, glorious views of the Bay Bridge and hills of Berkeley and Oakland. A range of restaurants such as the local favorite Hog Island Oyster Company and Il Cane Rosso offer table service inside and out. Next, wind your way to the end of California Street and hop on one of the city's fabled cable cars. If this is your first visit to the city, ask the cable car operator to help you get to Fisherman's Wharf, where bay views, street performers and colorful characters abound. Look for the sea lions at Pier 39, snack on Dungeness crab, take a Bay cruise or visit Alcatraz. For a truly unique brand of vintage fun, visit the Musée Mecanique housed in a warehouse on Pier 45. The vast collection of antique arcade games and fairground fortune-telling machines provides tons of fun for just a handful of coins. Next, turn up Columbus Avenue and wander into North Beach, the city's zesty Italian neighborhood. A haven for Italian immigrants, Beat poets, jazz musicians and starving artists, the neighborhood is also home to the perennially popular Beach Blanket Babylon — book tickets well in advance for this famously irreverent musical. While strolling the shop-lined streets of North Beach be sure to stop for a cappuccino or tiramisu at Café Zoetrope, and don't miss a visit to the famous City Lights Bookstore on Columbus at Broadway. For dinner, Perbacco Ristorante + Bar closer to Market Street, or head back to the Ferry Building, the home of Slanted Door, one of the country's best-known spots for upscale Vietnamese cuisine.